Larry Clinton CDs @ Hep Records, jazz in depth from the 1930's to the present day. Larry Clinton, born August 17th, 1909 in New York, first came to the attention of jazz fans as the arranger who joined the Casa Loma Orchestra after Gene Gifford's departure. He was also a competent musician who could play trumpet and trombone although not with the Casa Lomans. His compositions and arrangements such as "Study in Brown", "Shades of Hades", and "Zig Zag" were recorded by the band to become classic swing fare. He also submitted arrangements to Tommy Dorsey in 1937 and two titles "Satan Takes A Holiday" and "Dipsey Doodle" made a big impact. Largely at the behest of Victor Records and with Dorsey's encouragement he first formed a studio band and opened his recording account with "Big Dipper", and then made it a touring reality appearing at the Glen Island Casino in the Summer of 1938. Clinton's arrangements were musically well-crafted and danceable rather than inspirational or innovative, but with a string of hits such as "Martha", "I Dreamt I Dwelt In Marble Halls", and especially "My Reverie" the band became nationally famous. Clinton's vocalist, Bea Wain, must also be credited for the success of the band as she was undoubtedly one of the best singers of the era. While never reaching the heights of Goodman's or Dorsey's popularity the Clinton band did very well and remained active into 1942 with many recordings for Victor Records including the famous "Studies In..." series. Bea Wain, who moved on to pursue a solo career, was replaced by Terry Allen and Peggy Mann. Clinton served throughout the Second World War as a flying instructor with the U.S. Army Air Force. On returning to civilian life he reformed in 1946 for some studio sides for the independent Cosmo label, and briefly went on the road again in 1948 before going into semi retirement. In the middle 50's he returned to the Victor studios to recreate his old hits "In Hi Fi" with an all star band. He died on May 2, 1985, in Tucson, Arizona. 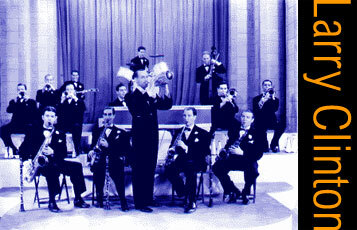 Larry Clinton & His Orchestra - "Jump Joe"
Larry Clinton & His Orchestra - "Martha"